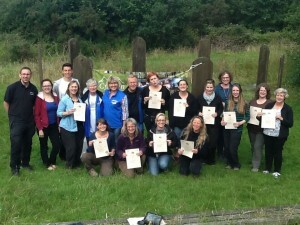 In late July 2015, Siw and Magnus Linde, and Karin Kajsa Kallstrom visited from Sweden to deliver the first Skosgmulle training in the U.K. For 3 weeks, they travelled from South Wales to Manchester, from there to Aberdeen collaborating with ourselves and the wonderful Rose Joyce and Juliet Robertson to lead 3 groups of training, focusing on different elements of Skogsmulle and its application in early years outdoor learning and teaching. As we have previously blogged, the movement towards bringing this celebrated pedagogy to the U.K. has taken many years, and much travel, even pre-dating our own connection with Siw and Mangus Linde over 5 years ago. The origins and progression of our experiences with Skogsmulle can be found here and on Creative Star; however, we want to reflect on an amazing few weeks spent with amazing and like-minded people. What became abundantly clear from hosting the training in Wales, attending the training in Manchester and speaking with our Skogsmulle UK partners is that there is not only a huge need to have a credible outdoors and nature based pedagogy in the U.K. but that there is also an appetite from individuals and groups to be part of a “movement” or ” method” from the ground up. 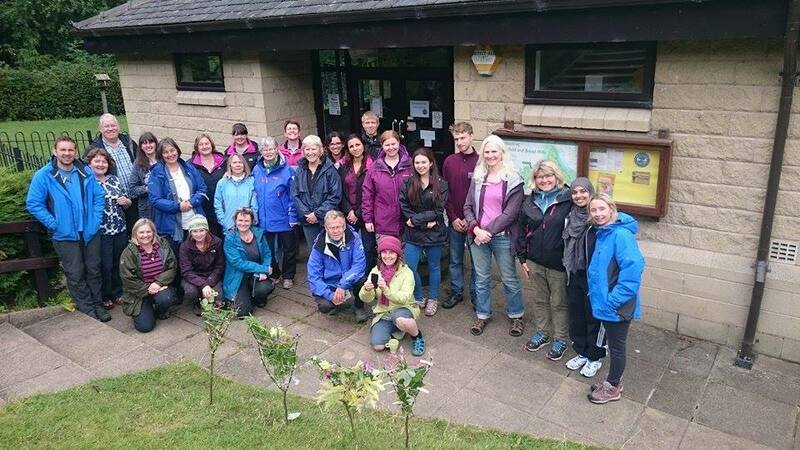 What made the training so special was the enthusiasm and skill-set of all who attended, with many trainees sharing positive and negative experiences of how they are trying to encourage more outdoor based learning in their settings. A number of countries have ‘imported’ Skogsmulle and some like Japan and Latvia have taken differing routes towards making it successful in terms of it translating into their cultures and education system. Here in the U.K. we very much want to empower our Skogsmulle Leaders to be a part of how Skogsmulle can be successful and to be part of working groups which will look at curriculum links and Welsh language. 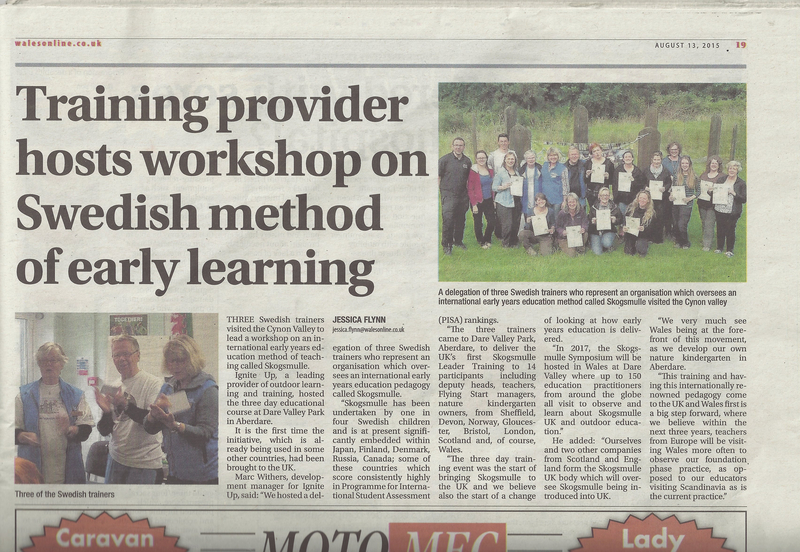 Whist remaining true to Gustav Frohme; Skogsmulle and the elements which have made it such a success we believe that with the input of experienced and talented early years practitioner and enthusiasts then we will have a great chance of putting Skogsmulle and nature based learning on the U.K. education map. The next steps. 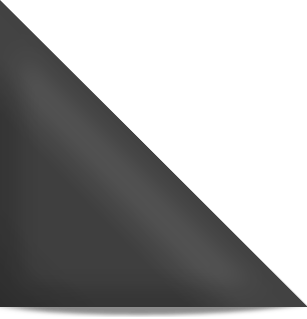 We have begun work on the establishing the working groups and have collated feedback from the Wales course Skogsmulle Training Evaluation PDF. We also have preliminary dates in place for a visit to Mulleborg, I Ur och Skur; “Rain or Shine” pre-school for Spring 2016, and Skogsmulle UK’s 1st birthday in July 2016 which will be celebration of this years launch training as well as outdoor learning as a whole. We very much hope our Swedish visitors and other Skosgmulle enthusiasts return for this event. 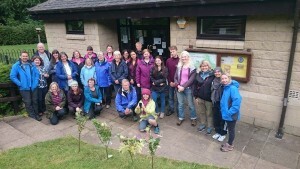 The 2016 celebration is the pre-cursor to August 2017 when the Skogsmulle International community will visit Dare Valley Park for the Symposium event. We believe that by 2017, there will be many examples of Skogsmulle becoming embedded into settings and practice, some of which we hope to draw upon when our colleagues from Japan, Sweden, Latvia and more visit for the symposium. In closing we want to thank Siw, Magnus and Kajsa for supporting us and being so inspirational in their practice and training. We also want to thank Rose Joyce and Juliet Robertson; both are inspirational in terms of their long standing beliefs as well as their commitment to outdoor learning and nature play; as well as the Skogsmulle U.K. movement. There are many more individuals to thank for their personal support for us on our journey towards embracing outdoor learning and play, and bringing Skogsmulle to the U.K. In 2012 in Japan things were just ideas and dreams for Skogsmulle in the UK, we can only imagine how much will be achieved in the next 3 years. Click here to follow the Skogsmulle U.K. Facebook group.